Shine in your 30s by embracing the woman you are and taking care of who you’re about to become. In our 30s our bodies start to change. Cell turnover rate slows and collagen and elastin production drops. But that doesn’t mean you can’t look your best! With high-quality cosmetic products and great care, you will look like a smarter and wiser version of your 30-year-old self. You may notice fine lines and that areas of your body look differently than they did even just five years ago, which is all normal. Develop good habits as an investment in your future. The best ways to combat the signs of aging is through prevention. Find time to regularly pay attention to your skin and use high-quality skincare products while in your 30s. New skin cells don’t form as quickly as they used to, so your skin may seem a bit duller and you may be developing fine lines. Use mild cleansers and moisturizers from SkinMedica or SkinCeuticals. Topical vitamin C helps your skin with collagen production and includes antioxidants that help protect your cells from free radicals, meaning they can develop and repair without abnormalities that lead to dark spots and wrinkles. Vitamin C will also help protect your skin from the sun when used with sunscreen. If you haven’t already been using a retinol in your 30s, you should start now. Retinol is a vitamin A derivative found in many skincare products that can help resurface your skin’s texture and get you that dewy skin you’ve been missing. It enhances collagen production, battling fine lines and improving your skin tone. Get into a routine, especially right before bed. Wash off your makeup and any buildup with a mild cleanser. Put on your chosen retinol followed by your evening moisturizer. Lastly, add eye cream to help reduce dark circles, puffiness and to keep those crow’s feet at bay. As a woman in your 30s, you have a busy life. A visit to our MedSpa in Oklahoma City can help you feel your best. Latisse can help you feel put together when you needed to run out of the house without makeup on. Your eyelashes will always look fabulous – even without mascara. 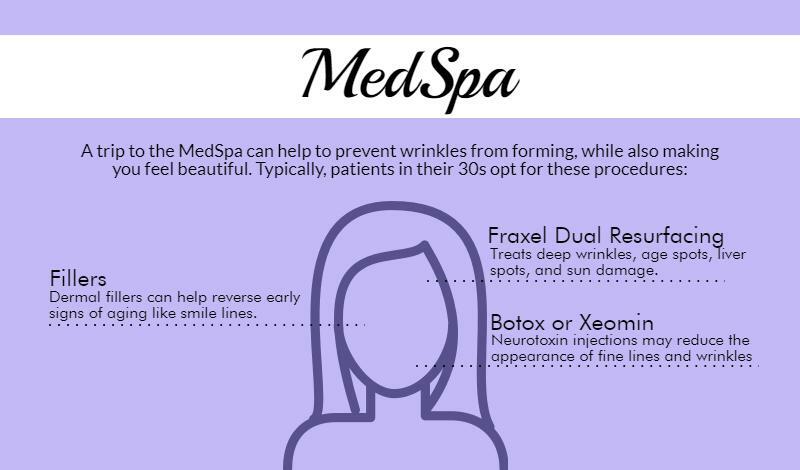 Prevent wrinkles with neurotoxin injections like Botox or Xeomin. Reverse early signs of aging with fillers like Juvederm XC or Radiesse. Women in their 30s may also start to see volume in their lips decline. Fillers like Restylane Silk can plump up your lips to be more voluptuous than ever before. Every woman’s needs are different, so we recommend seeking a professional opinion to help you decide which MedSpa procedures are right for you. 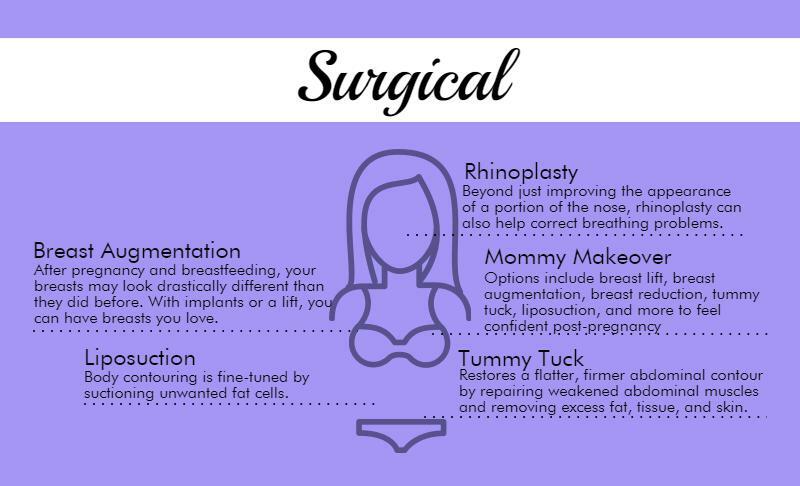 There are many reasons you may choose to have cosmetic surgery. Maybe you’re finished having children and you want to have the body you had before, maybe you just want to change your nose to a nose you love or maybe you want to change the appearance of your breasts. Women’s bodies may experience drastic changes after childbirth. You may want to consider a Mommy Makeover if you’re struggling with your new body. After pregnancy and breastfeeding, your breasts may look very different than they did before you became a mom. Whether you’d like to restore shape or size, a breast augmentation can help you feel like you did before kids. Pregnancy may also have caused your midsection to sag. A tummy tuck and/or liposuction will remove those hard-to-get-rid-of fat cells. There are no wrong answers when it comes to creating a beautiful reflection of you. LOVE your reflection, no matter what your age. Come see us at Dr. Tim Love’s office in Oklahoma City! Call (405) 751-LOVE, or contact us online to schedule a consultation. 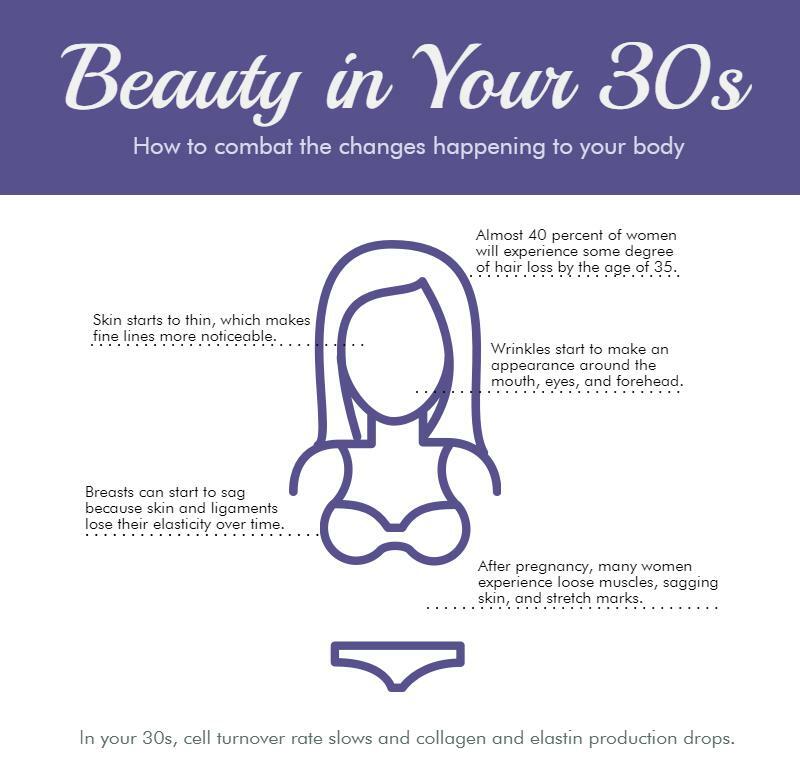 Download our Beauty in Your 30s complete infographic.